Mobile enthusiasts are using their phones more and more often to take pictures and share them online. Social networks like Flickr, Instagram, and Facebook have all grown huge online presences accompanied by millions of these photos. But, despite all of these popular photo-sharing platforms, taking photos (and sharing them) from a smartphone is usually done one photo at a time. Out-of-the-box smartphones can rarely do more with your photos than email them or post them to popular platforms. But, an Android device withÂ Photo Grid installed can allow you to combine your photos into collages quickly, easily, and without the aid of any additional photo editing software. While it’s not meant for extensive, precise photo editing, it does allow you to add extra flair and sentiment to your informal photo sharing. 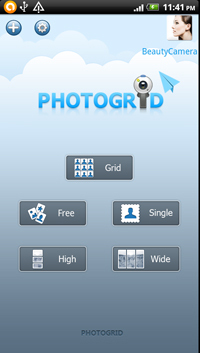 Upon launching the app, you are immediately prompted to choose what type of Photo Grid you want to make. Grid arranges your selected photos into a template, FreeÂ lets you customize how each of your photos are positioned, Single only uses one photo, High and WideÂ are vertical and horizontal photo strips, respectively. Once you choose the layout style, you are then shown two tabs where you can choose your photos. The Gallery tab shows photos saved on your phone’s native photo library, while the My Folder tab lets you collect several images and group them into one customized folder. Tap on the photos you want and press Create. 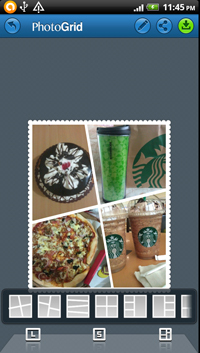 The app only allows a maximum of nine photos for each collage. You can also press ResetÂ to change the selected photos. Your photo collage is now shown in a default layout, but you can select from different layouts by pressing on the layout box icon on the bottom right corner. In GridÂ mode, you can also shake your phone to change layouts randomly. The High and Wide modes do not allow for changing of backgrounds. The Free mode, however, lets you tap and hold down a photo to rotate and resize. Tap on it again to bring it to the front of another photo. The P/L icon on the bottom left is for toggling the image from portrait to landscape. The most unique (and useful) feature of this app is the “S” logo in the middle that sets the image size into a square to fit Instagram’s format. This is definitely something Instagram fans can appreciate. If you want to tweak some of the photos within the collage, there is a pen icon on the top right portion. Tap on this and you’ll be on EditÂ mode. 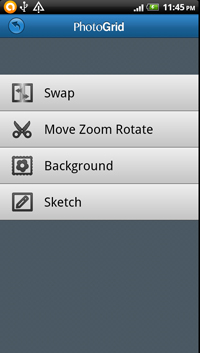 This brings up the editor page, where you can swap photo positions, move, zoom, or rotate a certain photo. To do this, simply choose the Swap option, tap on two photos you want to swap places and it should automatically adjust to fit the grid. You can alsoÂ change the background here, or specify a photo for applying a sketch filter. To undo the last action, there is a BackÂ button on the top left corner. This takes you back to your previous action. The BackÂ button is visible no matter what screen you’re on, so you can easily fix mistakes or roll back undesired changes. You can also preview background styles in real time by tapping on a blank space in between photos. I find this easier to do than having to go into editing mode. Photo Grid’s collection of backgrounds is a great feature to enhance the mood Â your collage. When you’re ready to save your photo collage, there is a SaveÂ icon on the top right corner of the screen. 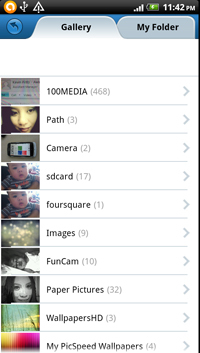 The image is saved on your phone’s Gallery within the Photo Grid folder. There’s also a share button for posting the photo to any social networking site or sending it via e-mail. Photo Grid is without a doubt a feature-rich tool, but its SettingsÂ page is quite limited for an app that appears to have lots of features. Here, you are allowed to change the file type: only two are available: JPEG and PNG. You can also adjust the quality and size of the image, but that’s about it. Although Photo Grid does deliver great looking collages, there is a minimal – almost unnoticeable – decrease in photo quality where it sometimes looks a bit blurred than the original photo. To ensure maximum quality, try to use only the best images from your collection. Perhaps with a few improvements along the way, Photo Grid can be the best-in-store app for creating digital scrapbooks to share with family and friends. It’s a great way to get creative and express yourself with a handful of images. 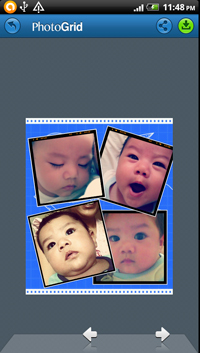 A picture does say a thousand words – so you can say even more with a multi-image Photo Grid collage.